Israel's Prayer Ban Just the Latest Example of State-Mandated Prejudice? Israeli police have banned Muslim men under the age of 50 from a contested shrine in Jerusalem's Old City, ahead of potential mass protests in response to the installation of metal detectors at the site. Critics may well be unsurprized at the discriminatory move, given the state’s history of legally mandated prejudice against its Arab minority. Known to Muslims as the Noble Sanctuary and to Jews as the Temple Mount, the shrine is revered by Muslims and Jews alike. ​In response to the ban, Muslim leaders — who allege the enhanced security is driven by Israel's desire to expand its control over the area — called for mass protests at noon prayers, Friday, July 21. 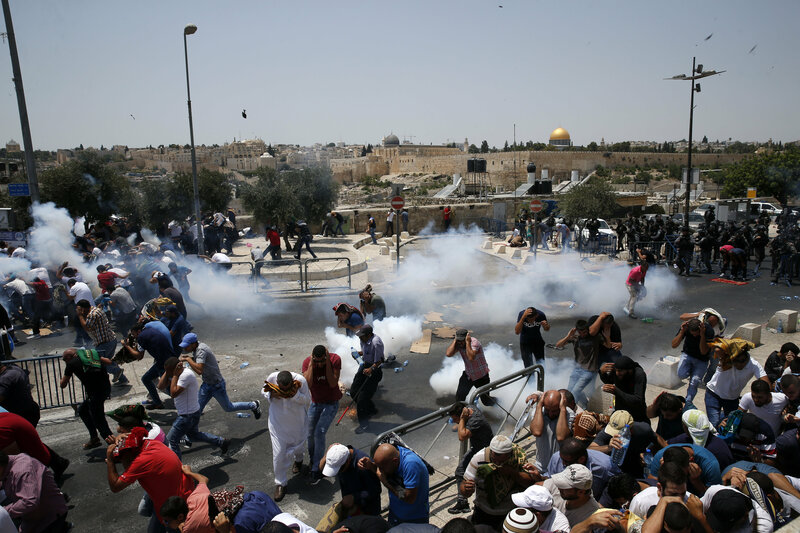 Palestinian worshippers run for cover from teargas, fired by Israeli forces, following prayers outside Jerusalem's Old City in front of the Al-Aqsa mosque compound after Israeli police barred men under 50 from entering the Old City for Friday Muslim prayers as tensions rose and protests erupted over new security measures at the highly sensitive holy site on July 21, 2017. Friday is the apex of the Islamic week — normally, tens of thousands of Muslim worshippers would typically perform prayers at the shrine. The security measures were added after Palestinian gunmen launched an attack at the shrine July 14, killing two Israeli policemen. ​While perhaps an understandable move given the assault, there's also arguably a degree of value to critics' claims the instruments are inequitable — for legal scholars have noted inequality in Israel is institutionalized. Under national law, there is no guarantee of full equality for Jewish and Palestinian citizens in most aspects of civil life. Moreover, at least some discrimination is unavoidable and fundamental in a state that defines itself explicitly on the basis of ethnicity. (File) Israeli security forces frisk a Palestinian youth in the Jerusalem's Old City on July 14, 2017, following an alleged attack. Three assailants opened fire on Israeli police in Jerusalem's Old City before fleeing to a nearby highly sensitive holy site and being killed by security forces, Israeli police said. In 2012, Adalah, the legal center for Arab minority rights in Israel, published The Discriminatory Laws Database. The report scrutinizes over 50 laws enacted in Israel since 1948 that directly or indirectly discriminate against Palestinian citizens of the country. While much of the legislation is not discriminatory on the surface, Adalah demonstrates these laws were nonetheless passed with discriminatory intent, and administered in a discriminatory manner. ​The most gravely prejudicial laws were established in Israel's infancy, and relate to land control and citizenship. Israel took over around 93 percent of all lands within the 1949 ceasefire lines, and the state has subsequently made this land available to Jewish citizens for development, while denying building permits and the ability to develop land to Palestinians. For instance, in 1950 a law on "Absentee Landlord Property" was passed, which defined anyone who was expelled, or fled, from the land that became the Israeli state after November 29, 1947 as an "absentee" — and their property was placed under the control of Israeli authorities. This was the primary legal instrument used to take possession of land belonging to Palestinians. The same year's Law of Return allows any and every Jew in the world to immigrate to Israel, and this extends to the children and grandchildren of Jews, as well as their spouses, and the spouses of their children and grandchildren. The flip side of this is the rights of Palestinians and others to enter the state and become citizens, even if they were born in the area that is now the state of Israel, are extremely restrictive. ​Legislation has seemingly continued on in this vein ever since. For instance, in 1952 the state authorized the World Zionist Organization, the Jewish Agency, and other Zionist bodies founded at the turn of the 20th century to function in Israel as quasi-governmental entities in order to further advance the goals of the Zionist movement, to the detriment of Palestinians. ​Furthermore, in 1969, a law was passed giving statutory recognition to Jewish cultural and educational institutions. 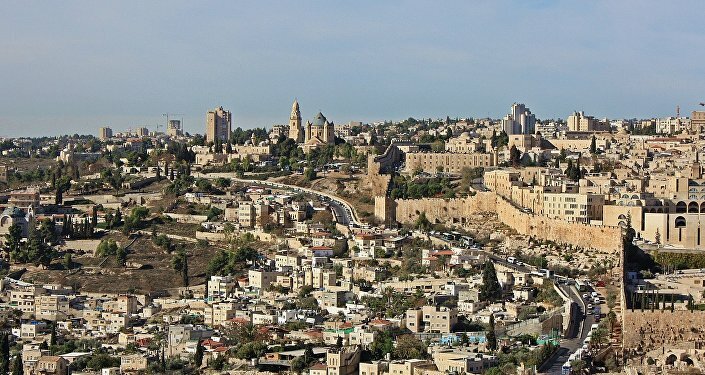 Part of the legislation mandates every Knesset session be opened with a reading of portions of Israel's declaration of independence, which emphasizes the exclusive connection of the state of Israel to the Jewish people. Moreover, it banned any political party that denies Israel is an explicitly Jewish state — meaning parties that advocate equal rights for all Israeli citizens are effectively precluded from obtaining seats in the state's parliament. More recently, in 2011 a law was passed empowering Jewish communities to exclude residents based on ethnicity or religion, and prohibiting any of the country's residents from calling for a boycott of Israel, its institutions, or any person — meaning Palestinians supportive of the BDS movement can be prosecuted, while Israeli Jews are free to call for a boycott of Arab-owned businesses. However, some observers can understand the need for the new security measures. "If we look at the dozens of attacks in Jerusalem in recent years, they're almost exclusively carried out by men under 50 and over 15, with the exception of some young women. You could say it was a discriminatory restriction of movement, but most countries in the world add extra layers of security in certain areas. 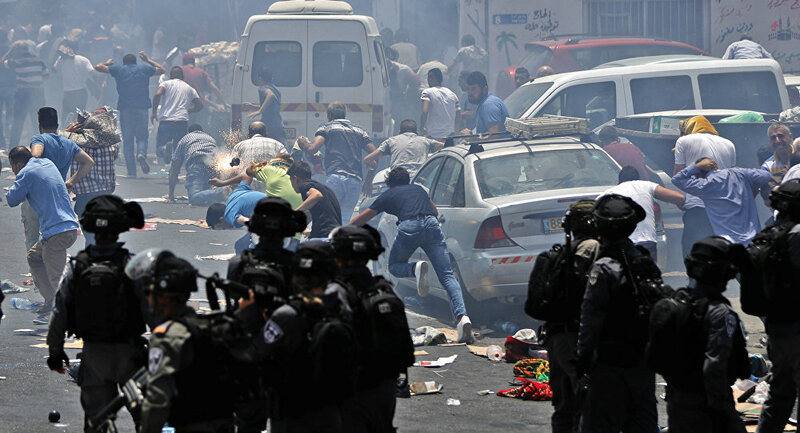 Israel has also put in place thousands of police and readied several army brigades in case of disturbances in the West Bank, along with controls at most of the gates of the Old City," Israeli journalist Seth J. Frantzman told Sputnik.